Active vs passive real estate investing in Texas is different than other types of investment opportunities. Real estate investing offers one of the most secure investment opportunities available today due to the investment being secured by the real estate. When you invest in stocks, bonds, commodities and other types of securities, typically you will work with a broker who will collaborate with you to choose the best opportunities that will provide the type of payout you want and your risk tolerance. You can choose high-risk investments that have a bigger potential short-term payout or more conservative investments that pay smaller short-term returns but offer more long-term stability. Regardless of which type of investments you choose, you have very little ability to control the value of the security you choose because that value is determined by the marketplace, not the individual investor. Active vs Passive Real Estate Investing is a great opportunity for those individuals with money to invest but short on time…. In other words, if you buy 100 shares of Amazon stock at $70.00/share, your investment is worth $7,000 at the time of purchase. While the value of that investment can go up and down, you have no real control over the value of Amazon stock. All you can do is research, predict and invest based on expectations, unlike in active or even passive real estate investing in Texas, as you will learn by calling (817) 550-5069 Opt# 8 today. 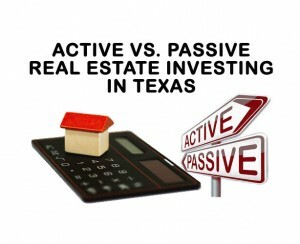 Active vs Passive Real Estate Investing in Texas – What Are The Main Differences? The main difference between active real estate investing and passive real estate investing is who is doing the work. If you’re actively investing in real estate… you’re finding the property, negotiating the deal, fixing up the property, finding tenants, managing tenants, and collecting the monthly rental income, etc. If you’re passively investing in real estate… you’re playing a much smaller role. Your role can be as little as just providing the money… and a turn key real estate investment company like All Wholesale Properties takes care of the rest. This is a very popular option for those with money available and but no spare time. With passive real estate investing in Texas when you go the “turn key” property route, management of the property usually will be handled by someone else, such as a property management company or an onsite property manager. Passive real estate investing in Texas, and our local area of Texas is a hands-free way to put your money to work for you without having to spend your time. Click here to find out how to get started in active vs passive real estate investing in Texas or call today (817) 550-5069 Opt# 8. With passive real estate investing in Texas through a turn key real estate management service, you maintain some control over the value of your investment unlike with stocks and bonds… and you don’t have to do the bulk of the work to acquire and maintain the property. Controllable’s that positively affect the value of your investment property include things like raising the rent, making improvements, such as renovations or upgrades, or marketing the property to increase its visibility and desirability. These are all things we at All Wholesale Properties can handle for you if you wanted the more passive investing route. Plus, all of these actions that change the value of your property can be done without you taking an active role in the management of that asset. You simply make the decisions and let somebody else worry about implementing them. Want to learn more about passive real estate investing in Texas? Give us a call today at (817) 550-5069 Opt# 8 day or night or connect via email here. To learn more about TMC Property Solutions visit our site here an please visit our Fort Worth BBB report here.